In the fall of 1993, at just eight years old, my football obsession started in earnest. However, the college game remained off the radar. Like most kids in the DFW area, I lived and breathed Cowboys football. My grandfather, father, and uncle worked as ball boys on the Texas Stadium sidelines for years. Sundays were for football. That isn’t to say the occasional college game would come on the family TV on Saturdays, but it certainly wasn’t a priority and I most certainly never understood the importance of what was going on. I had a vague idea of what Notre Dame was, even though I wouldn’t watch Rudy for another couple of years, but I certainly knew they were the team with the gold helmets. I could probably recognize Florida State based on their helmets as well, but probably more for their fans tomahawk chopping. I had no idea the game of century would go down in 1993. It could have been on my TV that fateful Saturday afternoon and I wouldn’t have realized the significance or probably cared. After all, my family had no college allegiance, save for a loose one with Texas, a fandom that I would drop a few years later once my mind focused on college and I learned of the wonders of Aggieland. So, as I mentioned in the IBG, 1993 remains more of a history lesson than a memory. The same could be said for the 2002 victory. I got in to Notre Dame in the spring of 2003 and quite honestly, it was the last school in the world that I thought would accept me. I spent more time arguing with my mom about which applications to fill out than watching college football. Notre Dame topped the list of schools in which I felt filling out an application was a waste of time and money. This is all a very long way of saying that my college football consciousness started in the spring of 2003, shortly after I purchased NCAA Football 2002. I learned everything I could about Notre Dame Football before campus. I couldn’t believe that I was actually going to this school that had all this rich history in a program. Not only that, Notre Dame was on a Return to Glory™! The fall of 2003 quickly killed that illusion. The game against Florida State was beyond miserable. I grew to hate the tomahawk chop because it was the only thing you could hear in that stunned Stadium…well, save for one brave student willing to do pushups for first downs in lieu of points screaming “BRADY, I BELIEVE IN YOU!” while in the pushup position. That belief was terribly misplaced. The Irish went three and out. However, since those dark times of Irish football, I have had many things to be happy about. In fact, I have now seen many a hated opponent fall at the hands of the Irish on multiple occasions: Southern Cal, Michigan, Michigan State, Stanford, and even Miami. However, there has been one team that I have not yet had the pleasure of watching lose: Florida State. I can’t think of a better stage than Saturday night to change that. It’s as close to the “game of the century” matchup that I’ve had the pleasure of witnessing–a top five matchup at the home of the defending national champs and Heisman winner. I want to party like it’s 1993* and experience something new. Let’s get weird, Notre Dame. Here’s your weekly Savin’ Aven update. I want to give a big thanks to the ND Club of Dallas as we raised $350 in raffle sales (a high for the year) for Savin’ Aven. 100% of that goes directly to this fund and with that, we are now up to $5,852 of the $15,000. Keep it up! Not all stats are created equal. In fact, when it comes to the playoff committee, it appears that some can’t even be discussed. Remember that theory that I had in last week’s Roundup? You know, the one in which I thought that Gurley got ratted out because he cut into someone’s profits. Turns out, I was right. The SEC needs a new commish. Mike Slive is stepping down and will be battling prostate cancer. I know we like picking on the SEC a bit here, but we definitely hope he recovers fully. 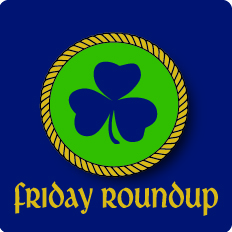 Lots of ND linkage this week. We lead off with Ishaq’s father making us all feeling a little bit better about a terrible situation. Then, we have an awesome piece about Joe Schmidt (cue a Molly swoon!). A great piece about student-athlete life at Notre Dame by someone that’s been through it. Finally, we have Zibby going from boxer to the NFL to firefighter. Don’t ask me how beer and amaretto manages to taste like Dr. Pepper, but I swear to you, it does. This drink will also destroy you, so consume wisely.